July 29th will go down in the Martin family as the day this family of four could let out a sigh of relief. You see, their family secret, held for 27 years, is finally out. And what a secret. 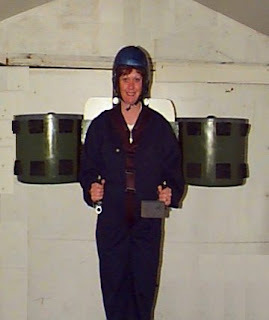 Glenn Martin began tinkering with the idea of a ducted fan jetpack more than 27 years ago. He worked on it quietly in his garage, without letting on to anyone (even his girlfriend). He married Vanessa, a registered nurse, and did eventually have to tell her. Through the years the pack, which works through torque-neutral ducted fans with vectored thrust and hand controls for roll, pitch and yaw axis, went through many evolutions. "We have control vanes at the bottom of the beast, down in the airflow, that give us pitch and roll; we have another set of control vanes around the center of gravity that we use for yaw, and a throttle for thrust. On the right hand is throttle and pitch, and on the left yaw and roll," Glenn says. Two Harrier pilots got involved in the later development stages. "We got to about prototype 7, and we knew it was ready to fly," says Glenn. When it was time to fly, Glenn, at 220 pounds, realized he was not the right size to be its test pilot. But Vanessa, at a svelte 135 pounds, was. "We were very, very conservative. We started out by just turning it on. He strapped me in, and we started with little hops, tethered, and with two people holding onto training bars to help steady things," Vanessa says. "You push the throttle and feel the power, and then you get light on your toes, and up you go!" she said with a laugh. "It's a sensation like nothing you've ever had!" We can only imagine. The Martin Jetpack burns 93 octane mogas, and is built to be a Part 103-legal ultralight, weighing 250 pounds empty. The company is currently taking deposits, and estimates the final price tag for the machine at $100,000. For more information go to www.martinjetpack.com.